• If you don't receive a return receipt you requested, it doesn't (necessarily) mean that your email was not read; instead, it could simply be that the recipient has configured their email program never to acknowledge those, or that he/she has manually declined to honor that confirmation request. When you compose a new message, reply to, or forward an email, you can manually request a read receipt by going to the Options menu and choosing "Return Receipt". You can tell that SeaMonkey Mail registered that setting by looking again at the menu: a checkmark is now visible; if your change your mind, simply uncheck that option by clicking on it once more. By default, return receipts are never requested. Note: that option will automatically be checked if SeaMonkey is configured to always ask receipts. Uncheck it to skip the request for a particular message (receipt settings explained below). SeaMonkey Mail will display a confirmation bar above the message headers when you open an email that has a return receipt request attached to it: click "Ignore Request" to dismiss that message for good (see side info below), and not acknowledge it to the sender; click "Send Receipt" to let the sender know you read their message. Side info: read requests "travel" over the web with that information embedded inside the email headers. When you decline to acknowledge a request, SeaMonkey doesn't modify the original message's headers - this is why you may see that request appear again if you check that same email account from another email program or webmail client. • To configure request options for all email accounts ("global settings"), choose "Preferences" under the Edit menu (note). Select "Return Receipts" on the left. • To customize an email account in particular, choose "Mail & Newsgroup Account Settings" under the Edit menu, select that email account on the left, and click "Return Receipts". Tip: the only difference between these screens is that the return request settings for an email account includes a choice at the top: "Use my global return receipt preferences for this account" (selected by default). Everything else is the same. To override your global settings, simply check instead the "Customize return receipts for this account" option. 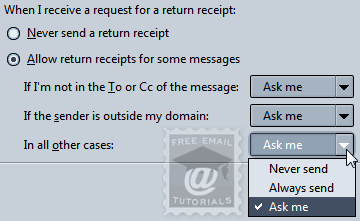 To automatically request a read receipt whenever you send emails from SeaMonkey, check the "When sending messages, always request a return receipt" checkbox. The default behavior is to have the acknowledged return receipt notifications go to your inbox; select "Move it to my Sent folder" to store them there instead. To accept these requests, but control how SeaMonkey Mail handles them, make sure that "Allow return receipts for some messages" is selected. In the default scenario, SeaMonkey always asks you what to do, but you can configure one of three choices for each case: • "Never send": instruct SeaMonkey to silently ignore all these requests. • "Always send": silently acknowledge all these requests. • "Ask me" - default option: tell SeaMonkey Mail not to do anything until you manually click one of the buttons to confirm or ignore a particular read receipt request. "If I'm not in the To or Cc of the message": in other words, how should SeaMonkey handle requests when you have been blind-carbon-copied (BCC) in an email. "If the sender is outside my domain": very useful options for a company - with it, you can tell SeaMonkey never to send return receipts for people outside your domain (i.e., people whose email address doesn't end with the same "@domain.com" as you). Once you are done, click on the OK button to save your settings and return to your emails.